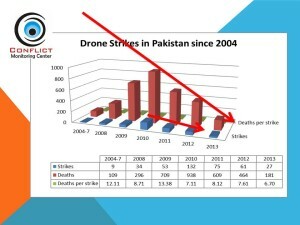 According to data released by the Conflict Monitoring Center, a remarkable decline in drone strikes in Pakistan has been observed during the year 2013. The Central Intelligence Agency (CIA) has carried out 27 drone strikes in Pakistan during the year, which are lowest in numbers since 2007. Drone strikes killed 181 people in Pakistan including some senior militant commanders. Since 2004, the CIA operated drones have killed 3306 people in 391 strikes inside Pakistan, most of them unknown suspected militants including hundreds of civilians. During 2013, 22 drone strikes were carried out in North Waziristan killing 131 people while 83 were reportedly injured. Four strikes were witnessed in South Waziristan where 44 people were killed and 24 injured. The CIA also extended its drone strikes beyond FATA in 2013, and hit a madrassa in Hangu district of KP. At the start of the year, the CIA had intensified drone strikes in Pakistan and carried out six attacks in first ten days of 2013. However, number of strikes was reduced to two for next three months. In May and June, number of drone strikes was further reduced to one strike per month. However, in July the number rose to three strikes. 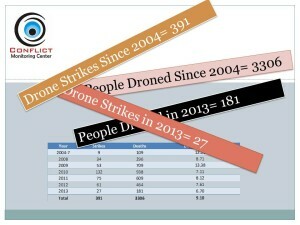 In August, October and December only one strike per month was reported while four and three drone strikes were reported in September and November 2013 respectively. In 2013, Nawaz Sharif became first Pakistani ruler who raised the issue of drone attacks at UN General Assembly since 2004 when the CIA started its covert controversial campaign in Pakistan. Previous governments used to condemn drone attacks but ignored to raise the issue at international level. During the year, Pakistan gained some achievements at diplomatic front against drone strikes. In December 2013, UN General Assembly declared that drone strikes are violation of international law. While federal government initiated campaign against drone strikes at international level in 2013, Pakistan Tehreek-e-Insaf and Jamat-e-Islami kept the public protest alive. A change in approach was visible during the year 2013, as the CIA had tried to limit ‘signature’ attacks in which generally unknown suspected militants were killed. Mounting public pressure in Pakistan and criticism at international level forced powerful American agency to focus more on militant commanders and lowering collateral damage. However, the damage had already been done as excessive use of drone strikes against suspected militants, funeral prayers and, rescue teams sparked international condemnation of the drone campaign. UN special rapporteur Ben Emmerson declared that drone strikes violated Pakistan’s sovereignty. 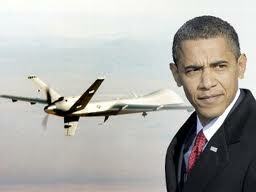 Recently UN General Assembly has also declared that drone strikes are against International Law. Citizen of Khyber Pakhtunkhwa and FATA have been protesting for almost forty days. 1. Molvi Nazir (head of his faction of TTP which has a peace agreement in South Waziristan with Pakistani security forces) along with his deputies Maulvi Atta Ullah and Rafey (or Rapa) Khan, Allauddin, Ihsan, Kochai and Chewantee. Drone strikes remained most controversial issue between U.S. and Pakistan. The CIA has kept alive its tradition of droning , during or right after high level visits of Pakistani leaders/officials to U.S. Prime Minister Nawaz Sharif criticized drone attacks in his speech in UN General Assembly and termed them the violation of Pakistan sovereignty and international law. However, the CIA responded with drone attacks on 29th and 30th of September, respectively just two and three days after his speech. A ‘welcome’ drone attack was also carried out on September 22 when Nawaz Sharif left Pakistan for U.S. to attend the UNGA session. Elimination of Hakeemullah Mehsud by drone strike during back-door negotiations sparked public protest in Khyber Pakhtunkhwa where ruling political party Pakistan Tehreek-e-Insaf along with its religious ally Jamat-e-Islami blocked NATO supply through the province with use of public support. The protest forced NATO to stop supply to and from Afghanistan through Torkham border and resorted to Chaman crossing in Balochistan. Despite continuous public protests, blockade of NATO supply and condemnation at international level, U.S. has not shown any signs that it will abandon drone strikes in Pakistan. Three drone attacks have been reported after PTI-JI started blockade of NATO supply including one attack in Hangu district of KP province. 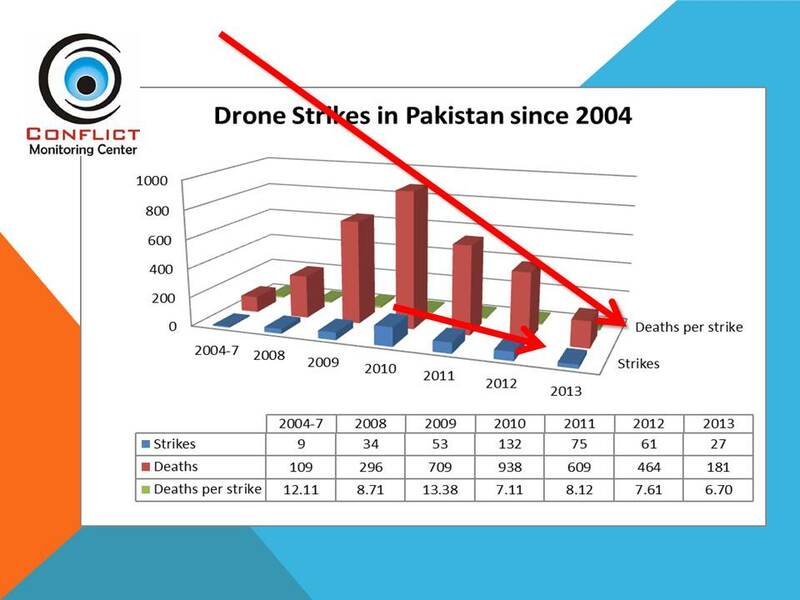 Following chart highlight comparison of drone strikes in Pakistan since 2004.